The DoD Bloggers Roundtable met to receive an update on earthquake relief efforts in devastated Haiti! Col. Tim McAteer commander of the 2nd Brigade, 82nd Airborne, Ft Bragg, NC met with us to provide lessons learned and "2nd BCT Commander's perspective". He assumed command in Haiti on 9 February 2010 and the 82nd continues to provide relief while preparing to redeploy and assume its role as the Global Response Force on call Brigade on 1 April 2010. The colonel highly praised all those responders to the Haitian crisis and said the initial response of American forces to provide security and order in Port-au-Prince was critical to the establishment of good order. He described the early environment as in total chaos due to losses among UN forces, Haitian police and government personnel. His paratroopers showed “incredible restraint” at times and with dignity, respect and order provided a security environment for the non governmental organizations (NGOs), USAID, UN forces and the Haitian government. He was extremely proud of the paratroopers and said they represented a wonderful cross section of the US and were true “ambassadors’ to the people of Haiti and he felt that the NGOs were surprised at how well they could work in the humanitarian relief environment. The paratroopers broke down barriers, changed attitudes, saved lives and ended suffering. He said the Port-au-Prince hospital situation was the best example of what they did for the country with security and medics to overcome numerous challenges. The hospital was overwhelmed with patients and the medical care due to numerous reasons was being conducted at a pre-US civil war level. Many of the medical staff had been killed and the arrival of the 82nd brought calm to a turbulent situation. The 82nd deployment is about to end (3,100 initially deployed in January and 900 are left) with command elements preparing to depart soon. He said the airport and naval ports are operating above capacity (prior to earthquake levels) and the security environment is vastly improved. He said the 82nd never saw any violence toward its troops and there were no incidents at food distribution points while they were on scene. The country is calm and the environment is vastly improved. He described the Haitian people as “thankful” and said the new relationships with other responders such as NGOs, UN and Haitian government personnel were ready to continue their support! I would like to add a rousing thank you to the men and women of the 82nd and all of our armed forces serving or who served in Haiti! You have made us very proud of our nation and its caring attitude! If you would like to read a transcript or listen an audio of the Roundtable please go to DoDLive! Hi, I am writing a paper on the U.S. military's post-earthquake humanitarian mission in Haiti and would like to speak with you about your experiences in Haiti. Please let me know if there is a good way to contact you. My email is my username at gmail.com - phone is 617-378-2579. Aquene, thank you for your interest in the humanitarian mission in Haiti. 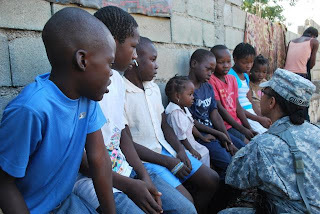 I wrote this blog and numerous others after speaking with the commander of of the US forces in Haiti. LTG Keen and most of his subordinate commanders as well. I am a retired US Air Force pilot who flew many humanitarian missions but did not go to Haiti during this effort to help the people of this devastated country. If you would like to contact me about the folks I talked to please email me dale@militaryavenue dot com.